It gives me great pleasure to type this thread up. 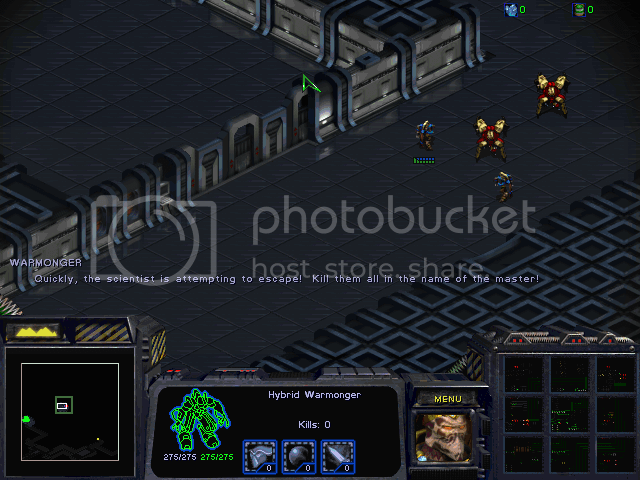 Anyone that's been following this project from the time of its resurrection so long ago will remember that I've always had the ridiculous ambition to create an entire campaign, a campaign the size of original StarCraft, ever since I was a small child when the game was first released, with my earliest attempts dating back to before even Brood War came out. After two failed attempts over the years to create such a campaign, it appears that third time's the charm. Yep, after about 4-6 months(!) of hard work, I've created an entire 30-level campaign, completely from scratch, doing all of the mapping, triggers, storyline, and writing by myself. The only thing that I've had assistance with is testing the maps. For that, I'd like to give a big thanks to everyone that's tested my maps, specifically Pr0nogo for helping me give my first 5 maps (by far the lowest quality ones in the set) a major face lift, noname for being a high caliber player testing the most difficult maps that I could concoct, and Zakaib for helping me get this project back on its feet, and Bobdoily well...just because. So without further ado, allow me to present a campaign with approximately 10 years in the making. As previously stated, this campaign is a full 30 level map set for Brood War. It does not require any special .exe to run, just stock BW. Also included are 6 “Cinematic” maps (these don't count toward the level count of 30, by the way), which help advance the story. You will play as all three races, with each race having 10 levels and 2 Cinematic maps, giving you an even split. These maps were made to closely adhere to the “classic” SC feel. Very little fancy stuff is used. No odd terrain, no stacked units/buildings, no “sprites”, etc. One other very important thing to note is that this campaign is extremely hard. If you were to rate the campaign maps on a 1-10 scale of difficulty, with the hardest Brood War maps registering a ~3-4 on the scale, there are multiple maps that would be ranked 10 or beyond. “Commando” maps will usually require near-perfect micro at all times. Later “standard” maps will push your ability to create the perfect attack force, attack at the right place at the right time, and manage your resources, to its limit. Unless I've vastly underestimated the SC community's skill, then beating the whole campaign without cheating is quite an accomplishment. If you seek a challenge or an opportunity to hone your skills, then look no further. Don't let the above paragraph scare you, though. If the difficulty gets too high, there's no shame in the odd cheat here and there if you find the level unbeatable. Also, the first few maps of all three of the campaigns are pretty minimal in difficulty, so nearly anyone can get their foot in the door. 1 player only. This is a single player Campaign. Every single tileset is used multiple times. Map size varies from as small as 64x64 to 256x256. Nearly every possible dimension combination is used. This campaign takes place shortly after Brood War's conclusion. 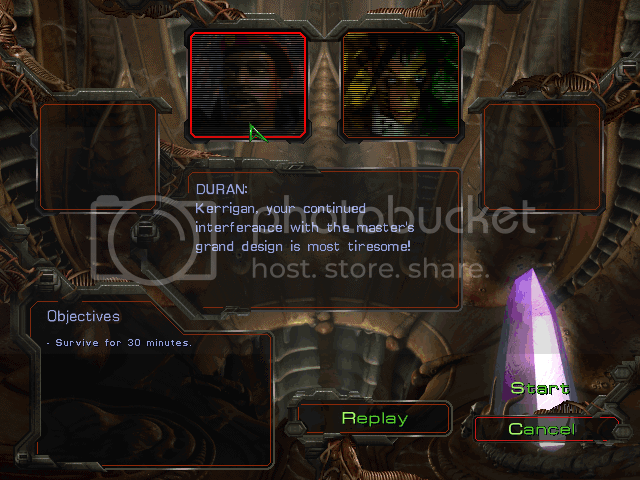 The Protoss have been broken, Zeratul is in exile after discovering the horrifying truth behind Samir Duran, and Mengsk has returned to Korhal to lick his wounds. The story was very heavily inspired by the Brood War secret mission Dark Origin. I encourage anyone not up to speed on that map (yes, all 5 of you) to either give it a play thorough or watch the dialogue from it on Youtube. As for the campaigns themselves, there are three different ones, much like SC and BW. The first campaign is the Zerg campaign, called The Grand Experiment. As the name suggests, this campaign focuses heavily around Duran and his plans to create the ultimate race of hybrids as well as revive his dark master. In these missions, you will almost always control Duran and sweep aside the various enemies that stand in your way. The second campaign, the Terran campaign, is known as Confederate Counterblow. 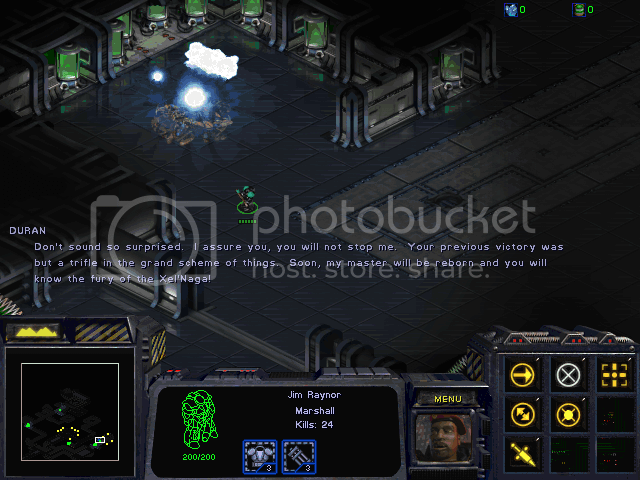 IT takes place immediately after the Zerg campaign's conclusion. This set of levels mainly stars Edmund Duke and his second in command, Jack Dark. Yes, General Duke. You read that correctly. 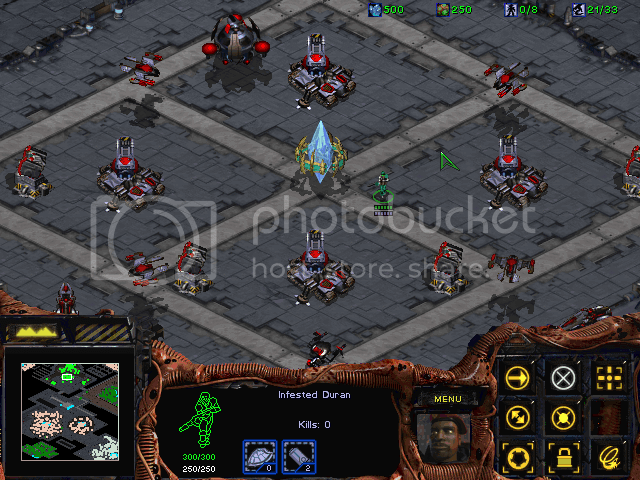 Duke's return is explained in full detail during the Zerg campaign. As for the Terran levels, Duke's army, Sigma Squadron, is recovering from the crushing defeat suffered at the hands of Duran and his hybrids. Once you're done rebuilding Sigma Squadron, Duke, bent on vengeance, sets his sights on Arcturus Mengsk and his recovering Terran Dominion. •Samir Duran – Duran's twisted schemes near fruition. Soon he will unleash his hybrids upon the universe. Can anybody stand in his way? •Edmund Duke – Mysteriously surviving his supposed death on Korhal, he's returned more grumpy than ever. This time he's got his own personal army, Sigma Squadron, at his back. The origins of this army, and Duke's survival, are unknown. •Xianou – A Protoss praetor, searching for Zeratul, under the command of Artanis. 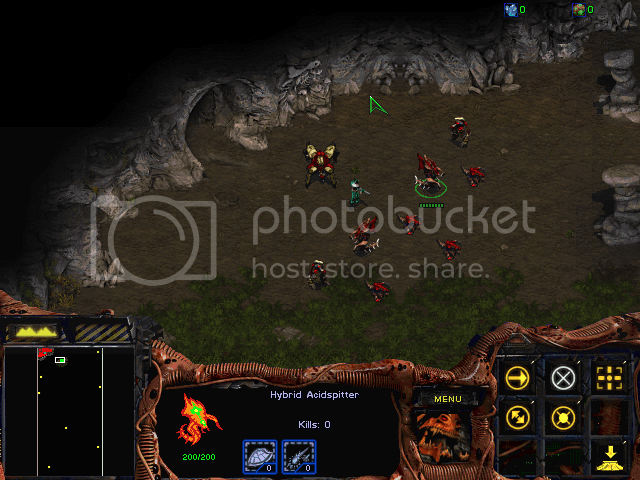 •Jim Raynor – Raynor's Raiders assist Artanis in searching for Zeratul as well as in the coming battles against the hybrids. •Artanis – Now the leader of the Protoss, is bent on finding Zeratul, for he strongly feels that he will need the Dark Templar's aid in the coming conflict. •Zeratul - Searching the stars for Duran's hybrids, he lives in constant fear of Duran's dark prophecy. •Jack Dark – The second in command of Sigma Squadron, an ace Wraith pilot. While Jack and Duke don't always get along, Jack serves Duke with blind loyalty. •Isaac – A Terran Dominion scientist. Isaac finds himself caught between a rock and a hard place until he is rescued by Jim Raynor. This leads Isaac to defect over to the Protoss. •Kerrigan – Now intent on hunting down our heroes, she quickly shifts her attention to Duran once she discovers what he's up to. •The Dark Lord – Little is known about Duran's mysterious master except this: if he is allowed to return, the entire universe will be in jeopardy. 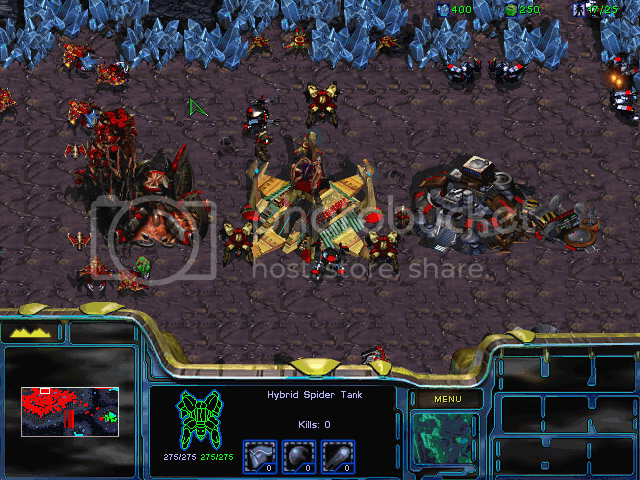 Briefing from an early Zerg level. Duran readies the defenses of his ship's power core. Duran's damaged ship has been repaired thanks to the large amount of minerals gathered. This important Sigma Squadron Command Centre is extremely well-defended. Duran's hybrids are finally awake and boy, are they powerful! Jack Dark rallies the forces of Sigma Squadron as they prepare for the assault on Korhal. Hybrid bases are pretty nasty. Sigma Squadron Commandos prepare to launch a devastating Nuclear strike on unsuspecting Dominion forces. Looks like the hybrids have gotten smarter. Many have obsessed over this crystal, but what is this guy doing with it? Duran has a mysterious visitor atop this large tower. Duran begins to reveal his true nature to our heroes. Zeratul readies his blade to avenge his fallen brethren. •Removed a misplaced Doodad in Z2 that created unintended unit pathing. •Fixed a bug related to the teleporter in T6(a and b) that could potentially cause the level to be unbeatable. •Fixed a possible bug with Cyan's dialogue in P4. •Slightly changed the spawn locations related to an event in P10 that created unit unplaceable errors. •Fixed a plethora of minor grammatical and spelling errors in the dialogue. •Z6 has been slightly rebalanced. Instead of your main, one expansion, and a gas-only expansion, there are now two normal expansions. The actual resource count on the map remains unchanged. Additionally, the map has received some aesthetic changes, reducing the amount of empty space. •The defences at the south of the purple Zerg base have been increased, making drop strategies more difficult to execute. •The number of "units" on P9 have been reduced from 1,340 to 1,280. •The number of "units" on P10 have been reduced from 1,337 to 1,280. •The Dark Lord's attack value was accidentally left at its low "default" value. Players should now find that he packs a lot more punch. 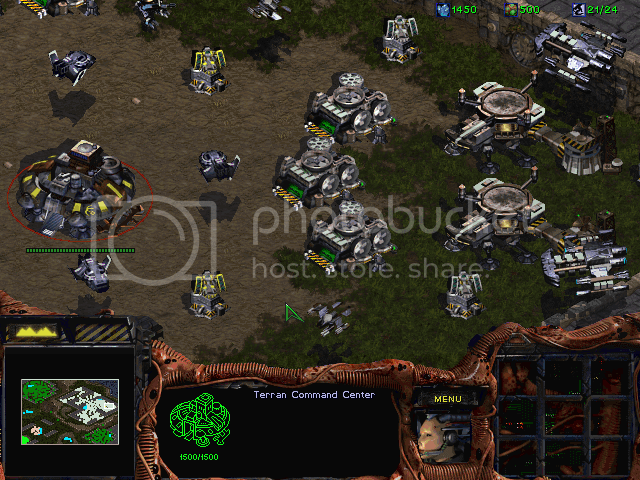 •The terrain near the player's main base has been slightly altered to help discourage a certain strategy that was causing pathing issues for the computer as well as potentially causing the "cannot create more units" bug. •The Hybrids should now be able to automatically see cloaked units. As one last footnote, the Protoss campaign is not as thoroughly tested as I would have liked (damn disappearing beta testers! ), so there may be a few kinks in it, especially in the difficulty department. Even though the campaign has officially been released, please feel free to leave feedback on how to improve it. As necessary, I will release new versions of it as important changes are made. Last edited by Robotronic on Mon May 17, 2010 4:32 pm, edited 1 time in total. Interesting project. I've already taken a look at the maps. You've done a great job! We don't see a fully finished 30-mission campaign released every day. I hope it is as hard as you say! At last something to test my skills! Krazy wrote: Also, just looking at the mini-map for some of them, I'm wondering: how many of these missions have you beaten yourself, without cheating? I'll dare to say (no offense) that cheats have been used, at least, in maps for screenshots 1, 2, 3, 6 and 11. (Though this doesn't mean he used the cheats to beat the maps. In testing stages, I often use cheats in order to easily finish the map and test the end scene triggers, among other uses. 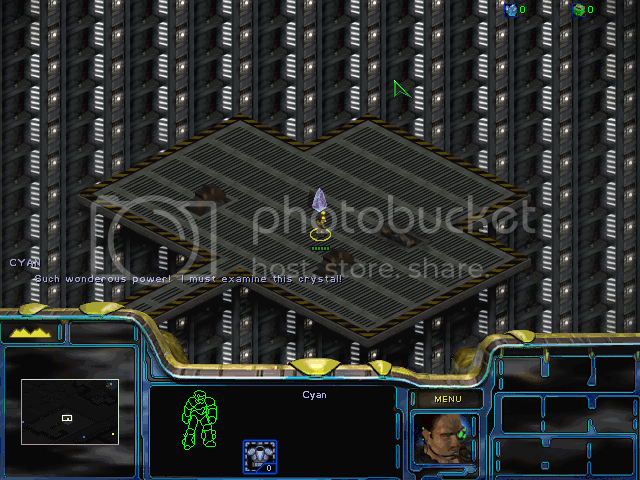 I've looked at the script of the map for screenshot 6 (don't remember which one is, is a Zerg one). 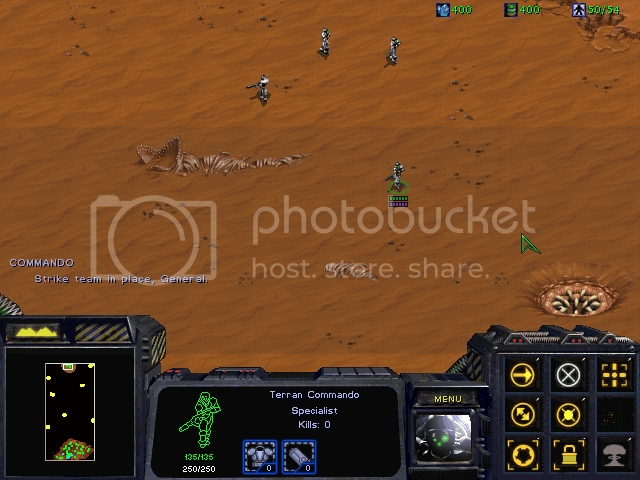 To win, the player must either gather around 12,000 minerals or destroy the enemy command centers. 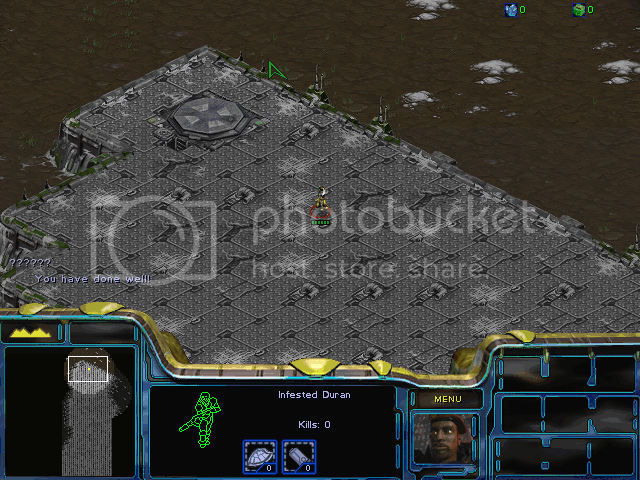 With cheats, this map is easily beatable, so I'd suggest to add as a objective the destruction of the enemy bases surrounding Duran's base (so to keep the player entertained, since in such a mission, most players would prefer to gather the resources instead spending even more resources to destroy every terran CC. It's a large map, and finding all CCs without cheats may be boring and time wasting). Just a suggestion. Krazy wrote: Final question: are you using any custom music, or are these just map files? Looking at the maps size, they don't seem to contain any kind of custom music. Not that I care of, but adding custom music would add a nice atmosphere to the campaign. It may be difficult to find music tracks for all 30 maps though. The vast majority of the maps have been beaten, without cheating. Those that weren't have had their difficulty based around beatable maps. Cheats were obviously used in alpha testing (where a lot of the screenshots have come from), or to quickly get to the point where I wanted to take a screenshot. The file has zero custom sounds, or music. The only sound my maps have is "nullsound.wav" so I can use it for Transmissions in game. If I were to add music, it'd need to be modded for the amount of situational music that I'd want to use. Most of it would end up being from classic Final Fantasy games anyway. Thanks for taking an interest in this! The later maps are certainly pretty brutal, as they either pit you against 4 hard AI scripts, each with a massive base, or against 3 AI scripts with merged bases as well as having "hero factories" that send very powerful units at your base on various intervals. The mission you're talking about, Feeding Frenzy, was supposed to be the Kel Morian Combine tribute level, where you just need to gather a ton of minerals to win. The "destroy CCs" objective was just thrown in there to give players an alternative for sitting back and bunkering down while the money pours in. There aren't any hidden CCs; you'll easily find them all if you run around the map smashing enemy bases. One reason why I made this optional is that one base is not accessible by ground. Thanks for the early feedback, by the way. Just because this is a release post, doesn't mean I won't be monitoring it for ways to improve the campaign. When you do get down to it, best of luck to you! The first maps are pretty easy, but I guarantee there are quite a few very hard ones too, designed to brutalize the player. 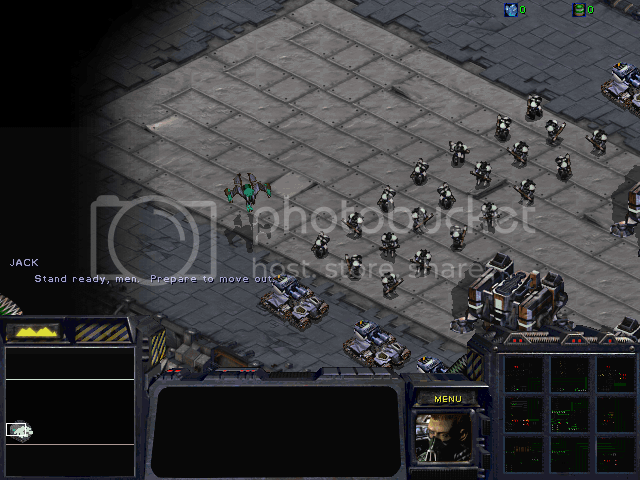 As an alternative, to easy things a bit, you can also enlarge the human player's base, or even to give him some terran units (representing the Raynor's Raiders, since Raynor is one of the human heroes). I have taken a look at the late maps and... wow! 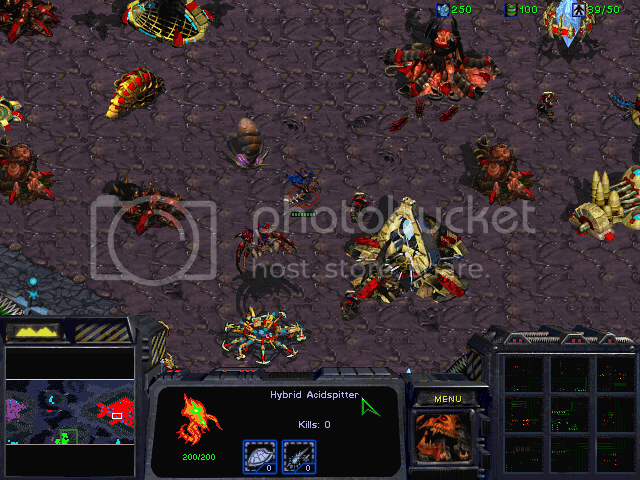 The enemy combined zerg/protoss/terran force seems just too massive for just a single mini-Protoss force. It'd help to have powerful units already available at the start of the mission to help counter early enemy attacks (Carriers, Reavers, and if you add terran units, Battlecruisers and Siege Tanks would be a good option). Of course I have not played the maps yet, so I'll be able to give you more feedback once I've tested the maps by myself. Congrats, Robotronic! I'll have to check it out when I've got more time. The one upside to the final two missions is the computers start supply capped, so they won't be producing new units for a while, which does give you some breathing room before things start to get too hectic. I made sure to include a lot of expansions as well as give the computer bases a very high concentration of resources, so taking any of them down will net you a large econ advantage. The rest of it is simply playing out of your mind to overcome the immense challenge of defeating a base that consists of all 3 races in addition to powerful hero units. I was debating throwing in some Terran units to back you up, but I did that in my first inception of the campaign (when I was 14) and I really didn't like the way it turned out, looking back. Actually, I hated the first version of Empire Wars so much that I scrapped all 29 of the levels that I'd made because they were so bad and rebuilt the whole thing from scratch. The only thing that remains the same is the majority of the storyline. I've played the first maps. So far they are good and easily beatable, as you said. I've, however, found a bug in mission 2. Not a critical one, though it is weird. What baffles me is that the misplaced doodad doesn't exist in my version. I opened the map just now, selected Doodads, and then selected the entire area that you pointed out. As you can see, there's no doodad there. If you're sure that the version of Z2 you have is from the full campaign .zip in this thread, then I'm very confused, as I haven't touched the maps at all since uploading it. In any case, I'm glad you're enjoying the campaign! The maps should continuously increase in both quality and difficulty as you progress through the campaign, as I made every map in order of appearance and the quality should go up as I got better at the craft. If anyone has headaches about beating a map, you can find in this topic several instructions about how to beat a hard map. As for that bug, Omega, I finally figured out what caused it. The bug indeed exists in the uploaded version of Empire Wars. The problem is that when I opened it to check your report, I had "allow illegal placement" in SCMDraft2 disabled, therefore the misplaced doodad simply disappeared without a trace. I'm currently working on the first update to the campaign which actually fixes a major bug in T6, so stay tuned for that. [Edit] The update has been released and the download link has been corrected accordingly. Last edited by Robotronic on Thu Apr 22, 2010 1:54 pm, edited 1 time in total. P10 has got a seriuos problem. I went carriers, and after the 10 minute mark, I could`t build buildings or train units, because there were too many of them in total I think. You should lower their number. God dammit, I was afraid of this. I don't know how the unit limit managed to get reached, as all 3 computers begin supply capped and the total number of units is over 300 below the cap already. Did you run into this on P9? Which parts of the bases do you think would be best to get rid of? Among a lot of minor changes were some that will hopefully fix P9/10. Robotronic wrote: God dammit, I was afraid of this. I don't know how the unit limit managed to get reached, as all 3 computers begin supply capped and the total number of units is over 300 below the cap already. Bulidings, interceptors. I don`t know what to change though. I reduced the unit count on both maps by 60. Hopefully that'll help!